Thank you. Thank you for supporting our students. Thank you for trusting our school district. Thank you for taking the time to participate in yesterday's election. As you may know, the election results show that voters have approved the Community Consolidated School District 89. This means we will be able to maintain the programming that has helped our students excel. The staff members of CCSD 89 appreciate that the community has such high standards for our young learners. I know hundreds of people worked on this referendum issue, whether it was walking door to door, attending forums, taking surveys, or examining the district's finances and plans. All of it was appreciated. I also realize that the referendum's approval comes with a financial sacrifice for many of our families. We are committed to honoring your contribution by continuing to look for ways to cut costs, save money, and reduce the tax burden for our residents. We will continue our tradition of fiscal responsibility to make this referendum last as long as possible. CCSD 89 first began talking about a referendum in 2011. This was a long journey and one I'm glad we made together. The district remains committed to delivering high-quality education, protecting taxpayer resources, listening to our residents, and empowering young learners. Thank you for all that you do - and have always done - to support the students of Community Consolidated School District 89. Thank you for supporting our students. Thank you for trusting our school district. Thank you for taking the time to participate in yesterday's election. CCSD 89 residents who have been asking great questions about the upcoming referendum. One question we have received is why the board chose to place a 40-cent referendum on the ballot. This video provides some background on how community input shaped that decision, and the long-term impact of a 40-cent rate increase. Find your DuPage County polling place by using the "District" function on the DuPage County elections website. 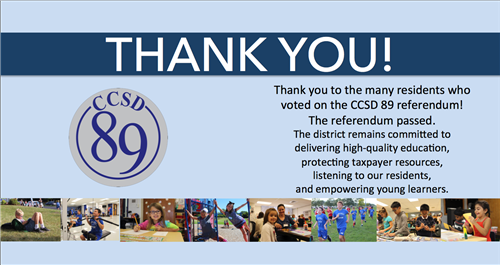 On behalf of the Board of Education, I would like to thank all of the families and residents who have been active and engaged participants in the conversation about the CCSD 89 referendum. No matter where you stand on the referendum, I encourage you to study the issue and vote on November 6 to give us the most important feedback we can receive. In a little more than two weeks, you will be part of charting the next steps for Community Consolidated School District 89. Tuesday, November 6, will be the first time in 32 years that CCSD 89 residents will vote on whether to change the operating rate for this district. A two-page information sheet summarizing the main facts about the November 6 CCSD 89 referendum. Residents can learn more about the Community Consolidated School District 89 referendum at two upcoming informational meetings. In order to maintain educational programming during a steady increase in enrollment, the CCSD 89 Board of Education unanimously voted to place a tax-rate referendum on the November 6 ballot. In order to maintain educational programming during a steady increase in enrollment, the Community Consolidated School District 89 Board of Education has unanimously agreed to place a tax-rate referendum on the November 6 ballot. Updated August 14, 2018: Answers to some of the frequently asked questions that CCSD 89 has received about the 'Our 89' community engagement work. On August 20, 2018, CCSD 89 Superintendent Dr. Emily K. Tammaru presented referendum information to the Board of Education. This document includes the slides that were presented at the Board meeting. The Community Consolidated School District 89 Board of Education is expected to vote Monday on whether to place a tax-rate referendum on the November ballot. The issue will be considered during the regular Board of Education meeting at 7 p.m. Monday, August 20, at Glen Crest Middle School, 725 Sheehan Avenue, Glen Ellyn. On July 16, 2018, Superintendent Dr. Emily K. Tammaru and 'Our 89' co-chairs Mike Lullo and Steve Neurauter presented the work of the Community Engagement Committee to the Board of Education. This document includes the slides that were presented at the Board meeting. It summarizes the work that was done at the three 'Our 89' community meetings, as well as the results of the district's surveys. This document includes a summary of responses provided by community members who participated in the second 'Our 89' sessions on June 19 and 23, 2018. Residents had a chance to weigh in on the programming and funding priorities for Community Consolidated School District 89 through online surveys that were open to all district residents, whether or not they had students in CCSD 89 schools. This document shows the results of the online survey. Residents had a chance to weigh in on the programming and funding priorities for Community Consolidated School District 89 through phone surveys to all district residents, whether or not they had students in CCSD 89 schools. This document shows the results of the phone survey. Residents will have a chance to weigh in on the programming and funding priorities for Community Consolidated School District 89 through phone and online surveys that are now available. Both surveys are part of the ‘Our 89’ community-engagement work that has been gathering feedback from a diverse cross section of district residents. View the slides for Superintendent Dr. Emily K. Tammaru's financial presentation at the June 5, 2018, 'Our 89' community-engagement meeting. This worksheet was used by community members who participated in an activity that asked them to eliminate the district's deficit while maintaining a high-quality education. Participants filled out this sheet individually and then reached a table consensus at the June 19 and June 23 'Our 89' meetings. Participants were asked eliminate a $100 deficit by increasing tax revenues, cutting school programs, adding programs, or some combination of all three. All of the items in this task were calculated to correct proportions of $100 to keep the activity simple. These program descriptions were provided to residents who participated in the June 19 and June 23 'Our 89' community engagement sessions. These descriptions were used as part of the activity that asked participants to eliminate the deficit and maintain a high-quality education. At the June 19 and June 23 'Our 89' community-engagement meetings, participants completed two activities that would provide feedback to the district. First, each table shared their observations from the feedback that was gathered at the June 5 'Our 89' meeting. Then, the participants completed a worksheet that asked them to eliminate a $100 deficit by increasing tax revenues, cutting school programs, adding programs, or some combination of all three. All of the items in this task were calculated to correct proportions of $100 to keep the activity simple. You can view the worksheet groups used for these activities at the link below. This document includes all of the responses provided by community members who participated in the first 'Our 89' meeting on June 5, 2018. CCSD 89 will hold two more 'Our 89' community-engagement meetings: 7-9 p.m. Tuesday, June 19, and 9-11 a.m. Saturday, June 23. Both meetings will be held at Glen Crest Middle School, 725 Sheehan Avenue, Glen Ellyn. Read the news release at link below.